What does it mean? Yes, what indeed does it all mean. Meaning of course is elusive and illusive. It can’t or shouldn’t be found on this bottle. Should it? Yet what if it was? Would you begin to look for pearls of wisdom or life direction on a beer label? Perhaps it’s been there all along. Since meaning is a mere illusion, perhaps we shouldn’t let it have any influence on our destiny. This particular beer refused to succumb to the illusion of meaning or allow capricious parameters to have any influence on its own fermented fate. Are we even asking the right question? Are you feeling frustrated in the emptiness? If so, that could be because someone got to this beer before you, and thus there’s a reason for that emptiness. It’s empty. And if so, perhaps there indeed is not any meaning for you here after all. Style over Substance, or Substance over the scriptures of Style? The latter, thank you very much. Twice. Bier Cabinet Spring Cleaning Continues. I had this beer in early March. It was part or the Beers of the British Isles or St. Patties Day Warm up, beer tasting at State Line Liquors. I thought it was the winner, the best beer of the tasting. It has been sitting in the cabinet ever since waiting for me to review it. This is a unique collaboration brew from Brew Dog in Scotland and Stone in Escondido, California. It is actually brewed in Scotland. I’m having a little bit of glass confusion. I’m not really sure what style glass to go with on this brew. It’s a stout so I could go with a Tumbler, it’s Belgian so I could go with a cervoise or chalice and it’s almost imperial in strength so I could also use a snifter. Dilemma, dilemma, what glass to use…. I talked myself into the chalice. Well, I actually talked myself out of the other glasses. 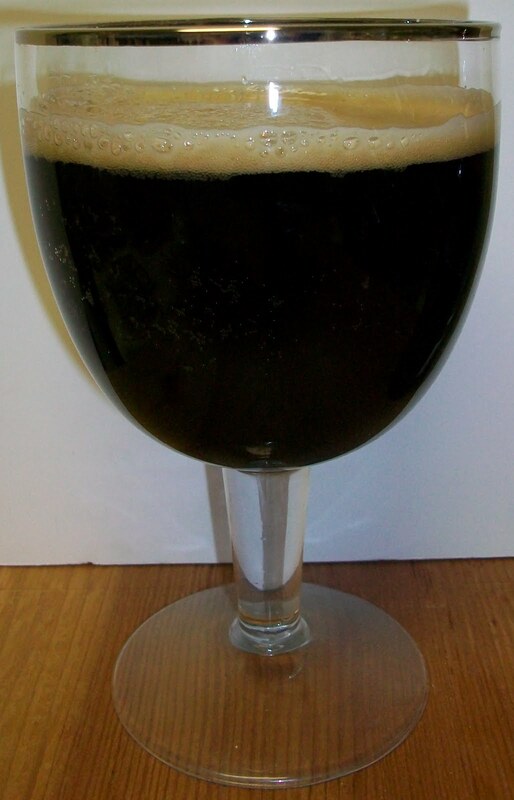 The beer pours a dark brown completely opaque with no light whatsoever getting through. It has a modest dark tan head. What a nose! Rich, stout like dark roasted malts with a yeasty background and notes of dark fruit, chocolate, a hint of spice and coffee. If the aromas are any indication of the beer this is shaping up to be a very rich and complex brew. Wow, no I really mean it, WOW! This is nice, very nice. And as the nose predicted it is a complex brew. Sweet dark roasted malts up front, then there is a somewhat creamy mouthfeel in mid-sip along with more robust malts. There is a malt bitterness/robustness that builds though out the middle of the sip. That robustness peeks at the top of the swallow but it’s never overpowering. The back end is still fairly robust but this is where you start to pick up some spice and some interesting yeasty notes as well. The finish is fairly dry with a slight hop bitterness, some leftover malt bitterness. The alcohol may also play a role in the dry finish. Although I must say you do not taste the alcohol you only sense the drying effect from it. The final aftertaste is a wonderful mixture of nutty flavors, almost smoky along with dark fruit, rich chocolate and some coffee malt flavors as well. There is that classic malty coating throughout your mouth and you find yourself exploring all the nooks and crannies with you tongue searching and savoring all the nuances of this delectable brew. The warmer it gets the smoother and creamier it also seems to be getting. Again I don’t have my thermometer (broken) so I can’t give you actual temperature on this one. It is still somewhat chilled so I would suspect mid to low 60’s. This is one amazing brew. The head has diminished to a patchy island in the middle with a still sizable ring around the edge of the glass. This is so unique I’m really having a hard time trying to come up with something to compare it to. It is stout like in some aspects of the malt flavor and that classic malt coating throughout your mouth. But it is also Belgian Like with the yeasty characteristics and some complexity like that of a Belgian Quad and the malty richness of a Belgian Black. And then you have a rich toasted almost smokiness quality to this like an America Brown Ale. I guess the bottom line is that this is unlike any other beer that I’m had. It really does not fit any particular style. Maybe that’s why Beer Advocate calls it an American Strong Dark Ale. 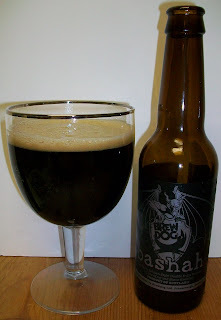 While BrewDog/Stone call it a “Black Belgian Style Double India Pale Ale”. No matter what anyone else calls it, I’m calling it Fantastic! The end of the glass has got to be pretty close to room temperature and it’s a warm night in early May. Even at this temperature this is still fantastic; smooth, rich and creamy malty goodness. AHHH, Good to the last warm drop. I highly recommend this beer to anyone that like a rich robust stout, black or even a robust porter. This ale is sure to please any dark roasted malt lover. Excuse me while my tongue searches for hidden remnants of this delectable brew.